For many people once they learned how to grill fish, it became a way of life for them. I see quite a few people at the river’s edge and creeks fishing. They take their grill with them and set them up beside where they are fishing. When they get hungry, they clean enough fish for a meal, place them on the grill and when done they eat. You can’t get any fresher than that. For many of these fishermen, it is the only source of protein that they eat. Not only is this very good eating but it is also very healthy. Grilling fish has grown in popularity in recent years as people are trying to get away from eating so much red meat in their diet. Fish has come a long way from tuna salad and tuna noodle casseroles. In many eating establishments, a well prepared fish entrée by a chef who knows how to grill fish is the selection of choice. Even though this is true, there are a number of people who tell me they do not like fish and refuse to eat it. If they learned how to grill fish I am sure they would change their minds. Like everything else, I think all fish and seafood takes on a delicious flavor when cooked over hot charcoals. The fishermen know how to grill fish when they cook it along the water as soon as catching the fish. You are not able to get this fresh fish when you purchase it from the supermarket and there is a difference in the flavor. Fresh fish will be free of odor, have firm flesh, clear eyes, red or pink gills and shiny scales that are not loose. The skin will not be slippery or sticky. The next best way to obtaining fresh fish if you do not catch your own is to buy it at a fresh fish market. Most of the time the fisherman will clean it for you so it is grilling fish ready. When you bring the fish home it should be cooked the same day as purchased. It will not stay fresh even in the refrigerator. Many people put the fresh fish in containers and fill with water and then store in the freezer. This method works quite well if your freezer is at 0F degrees. When I first learned how to grill fish, I learned a valuable lesson. I was grilling fish and as it approached doneness, it also flaked and fell into the hot coals. (Shrimp also falls through the rack.) I went out and bought me a fish tray for the grill to lay the fish on; you could also use aluminum foil. I never lost any fish after that. Fish grills quickly over moderately hot coals. To check for doneness, cut into the thickest part with a knife and fork. It is ready when it flakes. Shellfish is ready when it turns a milky color and is opaque. Fish is one of my favorite summer recipes and makes a great addition to any barbeque be sure to include some tasty side dishes as well as a few appetizers. Combine melted butter and remaining ingredients in a shallow dish. Rinse salmon and pat dry; place steaks on an oiled grill rack over hot coals. Cook salmon for 10 minutes turning 1 time until salmon flakes when tested with fork. 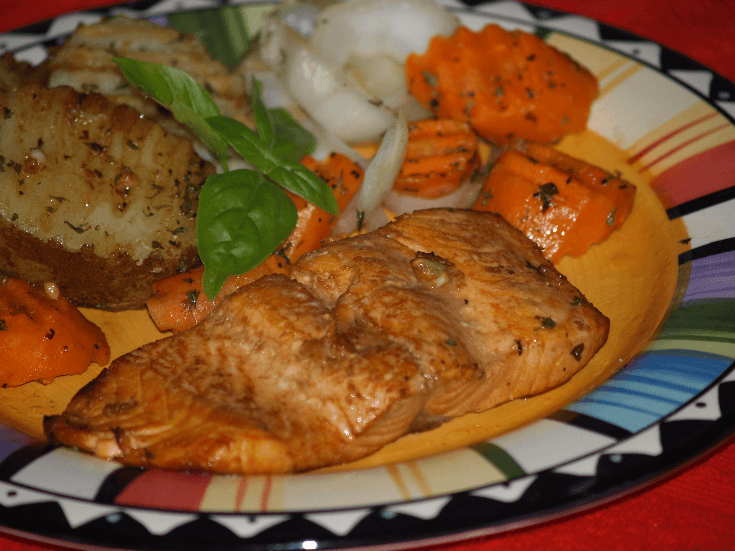 NOTE: Baste salmon frequently while cooking; serve with grilled vegetables. Combine all sauce ingredients in a food blender; blend and refrigerate. Melt butter in a saucepan; add lemon juice and chopped fresh dill. Place fish filets over hot coals for 5 minutes per side, basting with lemon butter while cooking. A good way to grill small seafood like shrimp and scallops is to thread them on a skewer to keep them from falling through the rack. Like other fish, you can also place them on foil or a fish tray to cook. Combine and blend all ingredients except shrimp to make marinade. Add shrimp to marinade and toss to coat; refrigerate shrimp mixture 30 to 40 minutes while preparing grill. Remove shrimp from marinade and pour marinade into saucepan; thread shrimp on 4 skewers. Lightly oil grill rack and place skewers over hot coals. Cook shrimp about 3 minutes and then turn shrimp over and cook 2 to 3 minutes longer. Heat marinade in saucepan to a boil and simmer 2 minutes. Arrange shrimp skewers on a platter and spoon hot marinade over top to serve. Lightly roast coriander seeds and paprika in heavy skillet. Combine roasted mixture with cardamom, dill, salt, pepper, onion, garlic and green pepper. Grind mixture together; add to yogurt and lemon juice to make paste. Prick fish all over with fork; rub paste all over fish, inside and out. Let fish marinate for 30 minutes to 1 hour. Heat grill to medium hot; set drip pan in grill. Place rack 4 inches above heat, oil grill rack and place fish on rack over drip pan. Cook fish about 15 minutes or until the paste is dry; baste occasionally with drippings. Raise rack to 6 inches and continue basting with drippings and butter. Cook about another 25 minutes or until fish flakes when pierced with skewer; turn fish over about half way through. Lower rack back to 4 inches and let skin crisp for about 2 minutes. When you learn how to grill fish, you will find it very convenient to use a hinged grill basket like in this grilled bass recipe. Season cavities of fish with salt and pepper; rub in with fingers. Combine all of the sauce ingredients in a bowl. Whisk until well blended and let stand 1 hour at room temperature. Brush outside of fish with sauce; place fish in hinged grill basket and place over hot fire. Turn basket over and over basting frequently while fish cook about 20 to 25 minutes. Place fish on platter; sprinkle with remaining sauce and garnish with oregano.